Shibboleth is a software package that is used in conjunction with some services that are hosted outside of Rensselaer by trusted providers. 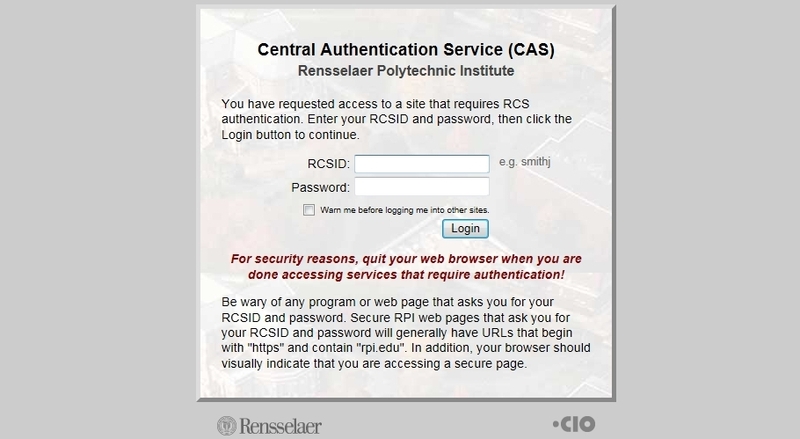 Shibboleth allows for members of the Rensselaer community to use their RCS account to access and utilize these services. As DotCIO upgrades some components of this service, the login page will change in appearance to the second image below. You may note that this new login page is similar to the one used for our updated CAS authentication service. Shibboleth began as an Internet2 endeavor and is a standards-based, open-source software program that provides Single Sign-On capabilities and allows sites to make informed authorization decisions for individual access of protected online resources in a privacy-preserving manner. It is used by many higher education institutions and other organizations. More information about this project can be found at http://shibboleth.net.